New Vedavoo gear offerings continue to pop up in the T.F.M. Store with a fresh batch of No-Kink Reel Cases in stock and ready to ship. These No-Kink Reel Cases were made in three sizes in Woodland Camo with Comrade or Retro Fly patches affixed on the cover flap. 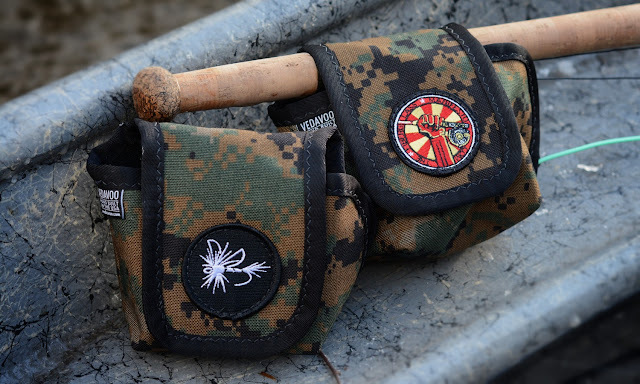 Like all Vedavoo gear, the No-Kink Reel Cases are a great design and made from heavy duty U.S.A. made nylon fabrics. Vedavoo gear will last a lifetime...and then some. The No-Kink Reel Cases are priced at $30 each shipped with T.F.M. and Vedavoo decals. Orders this month will also receive a complimentary high quality neoprene Retro Fly koozie included in the order. I can accept PayPal, check, or credit card for payments. Please send an email to thefiberglassmanifesto@gmail.com to place an order.